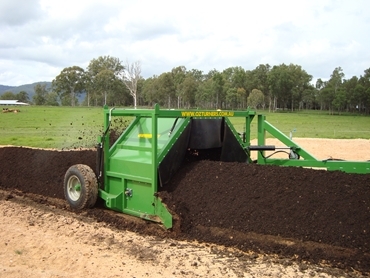 Compost turners from OZ Turners are used for mixing and aerating organic materials such as manure, vegetable waste, hay, and green waste, which after a small period of time will break down into a healthy, useable compost. Another important ingredient for making compost is water, which needs to be added during the composting process. OZ Turners compost turners feature a built in watering system to attach to an external water supply that sprays water inside the compost turner tunnel while the material is being mixed. The compost turner has a removable towing system that allows a water wagon to be towed beside the compost turner and pump water into the inbuilt watering system. As the name suggests, the OZ Turner compost turner is Australian made with all products sourced within Australia. Every compost turner sold is setup onsite personally by Company Managing Director, Dale Beck, who oversees the compost turner from the initial sale and the building process right through to the delivery and setup to ensure customers are completely satisfied with their new compost turner and know how to properly operate and maintain it.